Playing on the classic The Night Before Christmas, Nunn tells the story of Nova Scotia's search for a Christmas tree to send to Boston. With help from Santa, Buddy the Bluenose Reindeer is able to use his blue nose to locate the perfect tree. On the way to deliver the tree, his blue nose saves the day yet again when a collision at sea is prevented by the blue beacon. 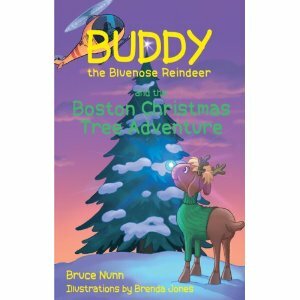 As a hero, Buddy is asked to turn on the lights of the Boston Christmas tree. Author, Bruce Nunn is from Nova Scotia.